Hope your day is warm and full of Bunny Bon Bons! 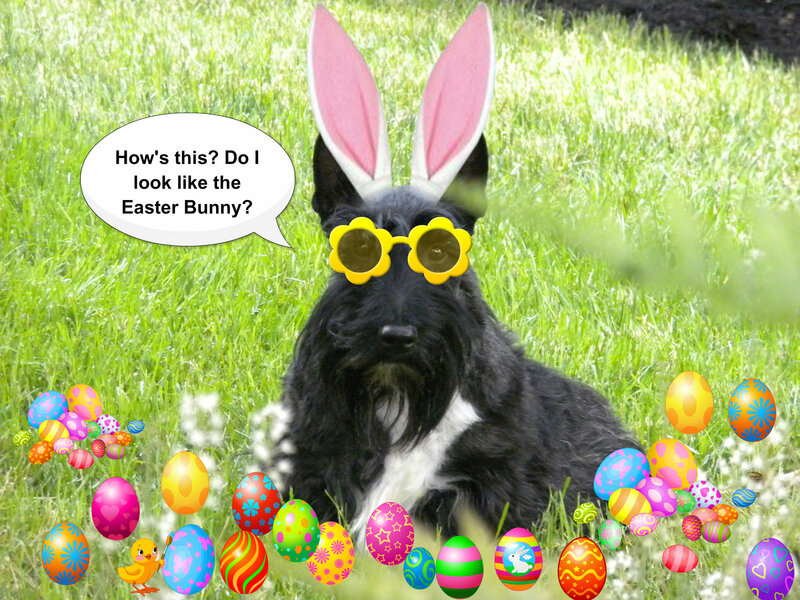 This entry was posted in The Scottie Chronicles and tagged Easter bunny, Easter eggs, Foto Fun, pets, photography, Stuart, The Scottie Chronicles. Bookmark the permalink. Happy Easter! Love those ears! Did you see our pics with our bunny ears on too? Hop, hop, hoppy Easter, Stuart!! A big Aroooooooo! and A very Happy Easter to you and your peeps Bunny Stuart! You can’t fool me. That’s not the Easter Bunny. Rabbits don’t have black noses. HAPPY EASTER STU!!! If you got a basket of treats with you, then YES you totally look like the Bunny to us!! Way too cute…. Have a “HOPPY EASTER” !!!!! Hello Buddy Bunny. You look GRRRRRRREAT. Look at all those pretty eggies you have. HA!!! Stuart you are too cute!! I think you look just a tad like the Easter Bunny!! More like a handsome scottie wearing fancy dress…..but cute. Hope you had a Happy Easter with some treats (not just green beans).